New-SealTM externally-pressurized, porous media gas face seals enable non-contact shaft sealing. 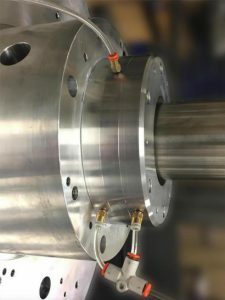 New-SealTM shaft seals can be used for sealing liquids, gases, fine powders, or slurries, with an easy path to retrofit. New-SealTM face seals can be designed to serve as a thrust bearing and a seal, simultaneously. A variety of input gases in addition to air can be used – including process gas.